Looking for Removalists Ringwood in Melbourne? Relocation, whether it is of your house or your company or business, is always a difficult task. Also, if you are moving to a new place, you can not even do it alone. Moving is really a tiring and a tough task. So, you must be searching for a relevant Furniture Removalists Ringwood that can render you with the quality services as Furniture Movers Melbourne regarding relocation at an affordable price. Here, on this page, your search for furniture removalists Ringwood is on its end. Singh movers and packers offer you the services regarding your furniture removal and goods removal to a newer place of you. 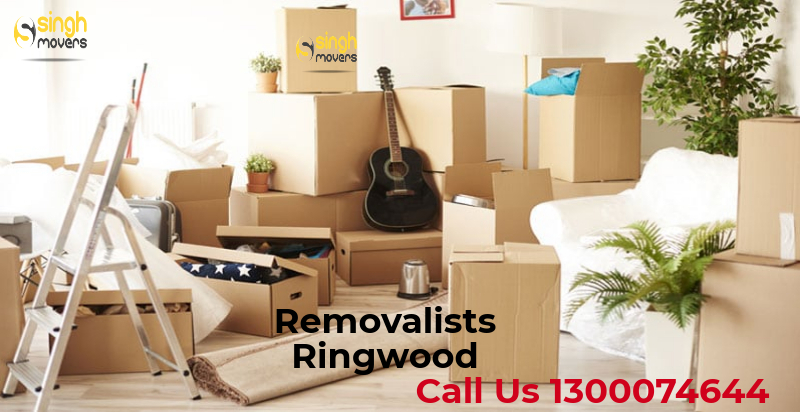 In the whole process of relocation, starting from the furniture packing, till the delivery of your goods to the place where you have to move, Singh movers and packers Ringwood will assist you and give you the best customer services. The trust that we have built in our customers is the only huge reason that people come to us for their work. Moreover, our services satisfy our customers in a good way. To make your move more and more convenient, Singh movers and packers can assist you if you give us a chance. The faith and trust of our customers that we have earned is due to our professionally skilled and experienced staff indulged in this work. Moreover, the facilities which we provide like storage services and packing services are best among all and thus, attract the customers towards us. It does not matter whether you are moving your office to a new place or relocating into a new house along with your family, it always is a tough task for everyone. Even your family also suffers from this relocation process. Also, the relocation process consumes so much of your precious time and may also cause a loss in the business. To avoid all the difficulties, you would you need an interstate furniture removalist Melbourne. Are you searching for a relevant furniture removalist Ringwood? Singh movers and packers provide their customers with the most trusted removal services that will make your move convenient. We offer you a stress-free move at a reasonable and affordable price. So, you need not worry much. You just have to contact us and rest everything and every work is up to us only. We will deliver your goods safely to your new place. So, hurry to hire us and give us the honor to serve you. This removal company Melbourne understands that how inconvenient our family feels when some relocation is to be done. To avoid this inconvenience, Singh movers and packers render you with the quality services that can make your relocation work easier and more convenient. Our team of workers are professionally trained and well experienced for execution of your furniture removal with so much safety. So, no harm will be caused to your goods at the time of delivery and packing. Everything that belongs to you whether it is your crockeries, furniture, piano or any other fragile items will be delivered to your new place safely. We have all the latest and useful tools for furniture removal, piano removal, pool table removal or any other stuff so these goods of you can be delivered without causing any harm to them. So, just give us a chance and see how our quality furniture removal services can help you and make your move stress-free. Singh movers and packers provide their customers with the moving services very conveniently and the following perks are also for the customers along with their work done on time. Zero depot to depot charges- We do not take any depot to depot charges from our customers. As we have mentioned in our quotes that what charges will be taken by us and that does not include depot to depot charges. The door to door charges only- We only charge for the door to door deliveries of your goods so as to provide our customers with a stress-free furniture removal and relocation. No fuel charges- We do not charge for the fuel used during the furniture delivery and other deliveries to your new place while relocating. Latest tools used- Our professionals use latest and professionally made tools for the furniture removal processes. These tools help in providing a secured and safe move for your furniture and other stuff. The tools which we use are trolleys, dollies, heavy duty blankets, shrink wraps, ropes, etc. These tools make us do your piano removal or furniture removal safer and convenient. No hidden charges: We do not have any policy to ask for any extra hidden charges after you hire us. We have clearly mentioned what is to be charged by us in the quotation given by us. You need not to worry about this. 24*7 support - We are here for you at any time of the day to clear your doubts and to solve your problems if you have any. Once you tell or ask us, we will surely do something relevant in the regard of that. We can assist you in your relocation if you give us a chance to. So, do not fret over anything related to the relocation of your house or office. Nobody is free to do the relocation work nowadays. Moreover, the loss in business that you may bear while doing shifting work all alone is just not acceptable. So you will need Singh movers and packers for this purpose. We are here to make your shifting work easier and more convenient. We also cover the area of Ringwood east to provide our customers interstate furniture removal services Ringwood East also. Quick and swift on-time delivery - We deliver your furniture and all stuff exactly on or before time without causing any delay in delivery. Customer satisfaction - We have gained the trust of our customers just by providing them with what we say as quality furniture removal services. Our customers get satisfied with our work, this is the true earning that we get as a furniture removalist. Affordable and reasonable price lists: We, the budget movers Melbourne have genuine price lists and you will pay us after you hire us for your work. Also, our prices are very reasonable and can be afforded by you all. And the services provided by Singh movers and packers are of no match with the prices that we take from you. Safest and secure most furniture removal- The well experienced and skilled professionals of our moving company will provide you with the safe furniture removal and also the secure delivery of your goods and other stuff. Completely insured and reliable move: We use our professionally designed tools for your relocation and shifting process so ay harm is not caused to your stuff. But if something unfortunate happens with your goods, then we will pay you for that loss to your goods. Storage services - We have huge storehouses for the storage of your goods if required. These storehouses are under constant CCTV surveillance so that to provide complete security to your goods. Professionalism- Our workforce is well experienced and trained professionally so as to provide complete safety to your furniture and everything. Our professional staff will provide you with the best services regarding furniture removal and shifting services. Is there still any need for thinking about hiring us? Just grab your mobile phone and clear your doubts and queries and make your work easier. We are one of the best furniture removalist Ringwood east and will help you with relocation conveniently. Ringwood is a suburb of Melbourne. It is located 30 kilometres in the east of central business district of Melbourne. The population of Ringwood is 10265 as according to 2016 census. The density of Ringwood is 2095 per square kilometre.